This last Saturday morning the Wallingford Community Council (WCC) held an educational session entitled “Wallingford Educates Wallingford” for neighborhood residents. This meeting was designed to update everyone on the details and status of Mayor Murray’s HALA and Grand Bargain initiatives as well as the potential effects on Wallingford renters and property owners. The meeting was held at the Hamilton Middle School, and I am happy to say that over 250 people were in attendance. This large crowd was due mainly to the hard work that WCC volunteers put forth in the form of personally calling on or “doorbelling” hundreds of residences with information about the meetings. In addition, the meeting was posted on the WCC website http://wallingfordcc.org, the Nextdoor neighborhood blog and the Wallyhood.org blog. What is HALA and the Grand Bargain and what is the timing of these initiatives? What new zoning is proposed and how will these up zones change Wallingford? Are the up zones really necessary to achieve affordable housing in Wallingford? What will the new zoning and HALA cost residents in terms of property taxes and increased rent? What elements of HALA are the WCC opposed to? What is the WCC position on HALA and affordable housing? What can residents do to get involved and have their voice heard? Participants were shown how buildings built under proposed zoning would compare to buildings built under existing zoning. In addition, during the meeting the WCC presented its position on the new zoning proposals and HALA in general. Visit the WCC website with focused attention to the WallHALA section to keep abreast of HALA and Grand Bargain happenings. To do so look in the WallHALA section of the site for relevant information. While you are at the site, why not order a yard sign to protest the proposed up zones? Join the WCC and attend monthly meetings on the first Wednesday of each month. Meetings are held at the Good Shepherd Center at 7 p.m. Attend the January 17th Urban Village Design Workshop put on by Councilperson Johnson, which will be held at the Hamilton Middle School beginning at 6 p.m.
Write or call Councilpersons Johnson and O’Brien as well as Mayor Murray to tell them about your concerns with the proposed HALA agenda. The slides from the formal presentation are posted on the Wallingford Community Council website at http://www.wallingfordcc.org/wallingford-educates-wallingford/. In closing, I would like to thank those who attended Saturday’s meeting and for taking time out from your busy schedules to participate with us last Saturday. Democracy is a wonderful thing, but it only works when everyone gets involved to help shape legislation and policies that affect the future of our great neighborhoods and city. The action that took place last Saturday is a shining example of democracy in action. Thank you for all your hard work Wallingford Community Council!!!! Thank you WCC — Lee, Miranda, Paul and the rest of your talented and dedicated crew. So grateful for your dedication. See you on the 17th! Thank you Glenn and all the WCC members who have worked so hard to get out accurate information about how HALA top-down recommendations and proposed zoning changes will affect all of the neighborhood. As Pres. Obama said in his farewell address we all need to stand together and be active citizens if we want to maintain democratic processes at all levels of government. Teaching tolerance and celebrating diversity, YIMBY style. If the brave urbanist who stuck this on my neighbor’s yard sign bothered actualy talking to my neighbor, they would learn that she is a grandmother and is a very kind and generous person. But because she has a”Keep Wallingford Livable” yard sign, she must be a racist, so she apparently deserves to have her property defaced. I guess the YIMBY’s got bored with just stealing the signs? I guess when you can’t win on the merits of your argument this is what they resort to doing. This is the second one of these stickers I’ve seen today. Has anyone else seen these yet? Its a great and wonderful world we live in! Can’t imagine someone taking the time it took to get this done. This person is obviously leading a “full” life. I’m guessing by the angle of the sticker this is the one we walked by yesterday…that’s the only one I’ve seen. Don’t like these signs myself, but messing with other people’s signs is not cool. Agreed on that. 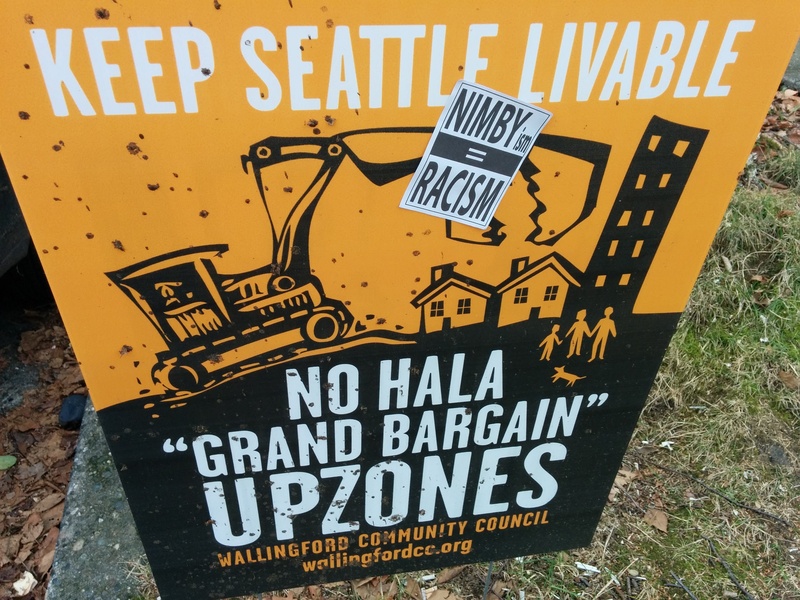 As much as a pro-HALA sign might irk me, I will respect other’s right to free speech, especially on their own property. Thanks for this great follow up and opportunities for additional involvement. This is such a critical time for our city and neighborhood. Kudos to the council and all involved! How do we find out about these meetings in advance? Thanks ! I’d love to be more involved in the community! Glenn briefly addresses that question in the first paragraph. I would encourage you and anyone else who lives here to join the community council – it doesn’t cost much – but anyone can come to monthly council meetings or sign up for email notifications. WCC works on other things besides land use policy – it may not seem like it lately, but there really are other things going on, parks and waterways for example – and it’s all volunteer and dependent on community involvement. If the facts speak against HALA, maybe it’s nonsense to have a pro-HALA meeting? It’s nonsense anyway, because the city puts enormous resources into promoting it, along with industry funded groups like Seattle for Everyone. They have very sophisticated PR, so there would be no point in trying to duplicate their efforts. The need is for education on the other side of the issue.